Widely regarded in China as one of the most healthiest green tea to drink, she has been scientifically proven to contain 3-4 times more theanine. There are more than 700 famous green teas in China - how many do you know? You may have heard of the so-called Ten Famous Chinese Teas, but this list was drawn up in the 1950s, it only highlights the superstars. Below the surface, there are hundreds of excellent green teas still in commercial production, waiting to be discovered by me and you! Of course, only the best of the best makes it to the Superstars. A superstar needs to stand the test of time. It is no wonder that all of the Famous Ten are at least 100 years old. Now you ask yourself this question: What happens if the list of Famous Ten is redrawn today? Would there be any changes? The answer is a definitive yes. Almost certainly you would see Anji Baicha being included. 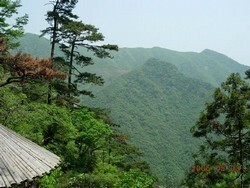 Anji refers to the place where she is grown: Anji county of Zhejiang province. The word baicha means white tea. The reason why Anji tea is so esteemed by experts and connoisseurs is because of its extremely high theanine content. According to tea expert Chen Qikun, she contains at least 6-8% of amino acids, of which at least 2.5% is theanine, roughly 3-4 times the levels found in other Chinese green teas. Theanine is the single most important determinant of tea quality. It is chiefly responsible for the soothing effects and full-bodied taste of fresh green tea. When we speak of a white tea, we normally the Silver Needle white tea, which appears white because it is covered by white downy hairs. Anji tea is processed like a green tea, but she is "white" because the tea buds harvested early spring is white in color. The higher the grade, the whiter the tea buds. Since less theanine is converted to chlorophyll, the tea buds contain higher levels of health enhancing theanine. 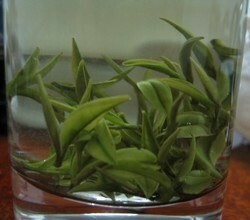 The tea buds are white in color. 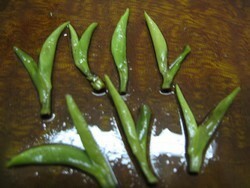 After processing, the tea leaves acquire a pale yellowish-green color. This white tea plant was noted by the most artistically endowed of Chinese emperor - Song Hui Zong (1101 to 1125 A.D.). The most prominent tea connoisseur of his generation, he noted a certain white tea plant is "extremely rare" and has "superior quality". Re-discovered 200 years ago in Zhejiang province, many historians believe Anji tea is this white tea plant. 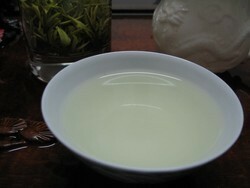 The Anji Baicha tea was invented as recent as 1981, but she has always come top in various competitions and assessments. There are many grades of Anji tea, with many trade-offs between price and quality. This AAA grade represents the authentic quality we would expect from an "At the Source" early harvest. We are very impressed. If you look at the steeped leaves closely, we will notice a distinguishing feature of authentic Anji Baicha tea: "white leaves and green stems", as you can see from the photo to your right. The tea liquor has a light body that is very sweet and fresh. During our testing, we found 2-3 grams can go all the way to 5 infusions. There is an exquisite floral aroma, and an excellent after-feeling. I waited to respond to you until I was drinking a cup of your incredible AAA Anji Baicha tea. Can you see me smile? I am not sure why I wait so long to order tea from you but that is going to change...thanks again. I started out drinking tea at work a few years ago. I began with processed powered energy tea, one cup in the afternoon to keep me from dragging and the discussion around tea blossomed into a tea club. I had about 6 co-workers bringing and sharing their special teas. This tea experience was the beginning of what has become a very important part of my life - quality TEA! Now the tea club is long gone and my good fortune finds Amazing Green Teas. You opened the door to triple AAA teas. These teas are so smooth. Once you taste a AAA tea you are hooked, there is no turning back to discounted or packaged tea bags. My only problem is getting out the door in the morning if I made a pot of AAA Anji Baicha. Thank you, I appreciate your global efforts to share the Tea! I give this tea a five. I see the 2012 teas are out. I wanted to reiterate how wonderful the Anji BaiCha tea is. I saw only a few reviews out there and one of them mentioned bitterness. I have never been able to get this tea to taste bitter no matter how long I steep it. I use a lower temperature (maybe 185-190F) for a long time since it seems to steep a bit slower than some to achieve its full flavor. But as I mentioned to you before -- the aroma is intoxicating, the smooth, silkiness of this tea is sensuous. It is the silkiest one I have tried and I have tried almost all of them. The flavor and aroma is floral with a subtle spicy undercurrent. It is a smooth, subtle tea but with a fine, distinct flavor (reminded me of pineapple!). I thought the Dongting Bilochun was my favorite because it is so spectacular, but I think this one is edging it out. Anjibaicha, has been my favourite spring tea. Although I've found it quite hard to brew! The way you recommend brings me consistent results, although the tea usually turns out slightly too strong for me, bordering with bitterness. It is definitely worth a try, but I personally prefer my green teas a slightly lighter in taste. Usually I brew this with hot water, and I wait until leaves get into vertical position, and some, not all of them to sink. This takes 2-3minutes, and I assume it would be a good way of brewing for those others who find your recommendation too strong for them. 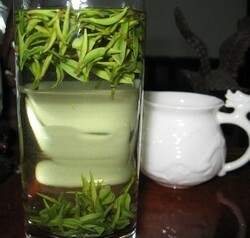 Prepared this way, your Anjibaicha tastes like a archetype of all chinese greens, in a fresh a good way. I've offered this to friends, who usually respond along lines "This tastes just like the green tea I've had, but better!" Just to tell you I really appreciated the Anji Baicha. It's pure theanine! Delicious and really soothing. If I compare to Teaspring's Anji Baicha, I would say the buds are shorter, seem very young, the dry leaves more compact and flat, and the aroma is a little more hay-like and a little less lemony-flowery. As for the mouthfeel, I can't really remember any difference, since I tasted the other one more than a year ago, and I would have to taste them side by side to decide which one is my favorite. I also had an Anji tea from Jing tea shop once, and it was o.k., but was of a later harvest, and so tasted a little less fresh and umami. I would rate the Anji Baicha tea 4.5 out of five. Thanks for asking. The Baihao is -- yes! -- better in 2014: quite wonderful. My favorite, though, is Anji. I am blown away by how it makes me feel as well as the fragrance (s) and feel in the mouth. The Anji is definitely for those who appreciate subtlety in taste yet tremendous power in effect on energy and mood, particularly for meditation. So it's not for someone new to green / white teas unless, perhaps, the palate and temperament are familiar with sensual savoring and/or meditation. Yes, feel free to use whatever serves your business as well as educating people. You are bringing a lot of fine experience and knowledge to all of us. Anji tea should be brewed the same way as the Dragon Well tea by infusing a small amount of leaves in high temperature water for as long as it takes.